In the picture the child is having fun with her tongue. Is it called a tongue twister? No, a "tongue twister" is a sentence that is very difficult to say correctly. 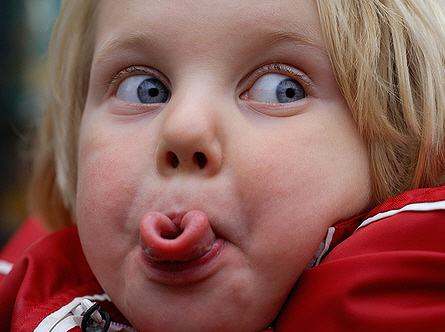 What the child in the picture is doing is called tongue rolling. See Tongue rolling on Wikipedia for more information. I can't speak for England, but in America I have always heard people say "She can roll her tongue." Just as a point of clarification, because based on the above, you might think it's appropriate to say "She can do tongue rolling." If you said that to me, I would have no idea what you were talking about, but I might fear it was something sexual. Not the answer you're looking for? Browse other questions tagged verbs image-identification or ask your own question. How is this instrument that makes sound from air movement called in English? What is the structure in which people sit on the elephant called in English?